On Saturday, I went to Fibre East for the first time and I wanted to share my experience with you. I've never been to any Fibre event in the UK before so I was looking forward to this one. I had no idea what to expect but I was hoping it would be fun and I wasn't disappointed. On Saturday the weather was nice which was a good start. We arrived easily at the event and were welcomed by friendly volunteers who guided us on an open field to park our car. Exhibitors were scattered inside the school in different classrooms, sport hall and outside in big tents and caravans. It was very pleasant to walk from one place to the other. There was plenty of space. It didn't feel like being in a school ground but more in the open countryside. I could finally see in real life two spinning wheels I was interested in and try another cute one, something I couldn't have done on the internet. I also got to meet Paul Brittain who built my compact drumcarder and have a chat with him. He's a really nice person and I can't recommend highly enough his work. 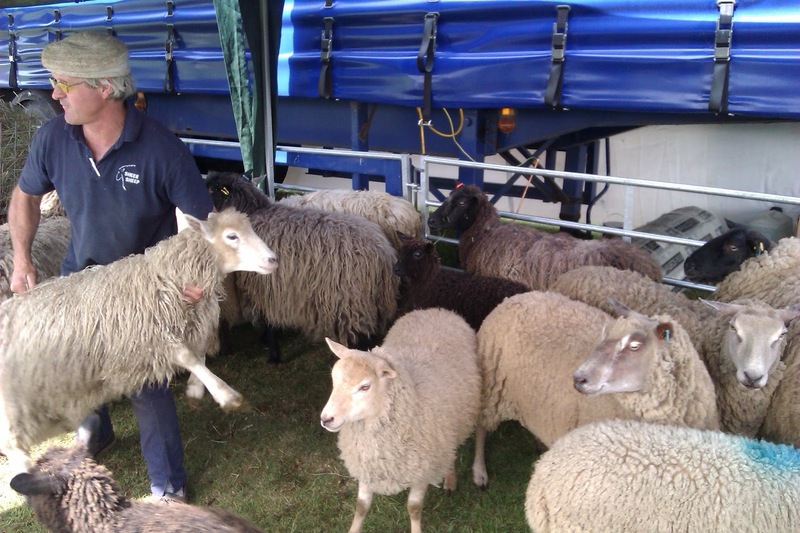 friendly atmosphere, the perfect place to be for sheep and wool lovers. It was also nice to discover the school has a little pig farm. Along with the mums, there were tiny piglets, some were all black and others were black and white/pink. They were curious and came close to the enclosure to lick our fingers. Soooo adorable !!!! My hat off to the organisers of the event who did a wonderful job. This was my first time but it will not be the last. I'm looking forward to going back next year.